The modern 5-star hotel in Jesolo (VE) gained 2 topic awards in the Venues category because of the versatility of its spaces and the quality of its services. A great success for Almar Jesolo Resort & Spa that for the first time competed in Eventex, one of the most prestigious award in the world for business tourism. Actually, it was a great success as Almar Jesolo has been the only Italian venue awarded twice in the 9 categories dedicated to Venues. 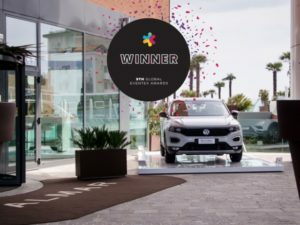 Almar Jesolo has been awarded for Das Welt Auto, a Volkswagen event organized in collaboration with IANTRA, that required exceptional creativity, advanced technology and brilliant entertainment solutions. The versatility of the meeting rooms allowed Almar Jesolo to host “3 events in the event”, with a spectacular presentation of the main product in the plenary room, divided into two areas – an exhibition area with a car on a rotating platform, and a training area with 3 models. Furthermore, two vehicles were put at the hotel’s front door that was connected to the room’s monitors in order to give participants the chance to see the T-ROC model’s performances and points of excellence. Right after the end of the work session, the whole space has been re-set up in record time to host a refined Gala Dinner. The three-day event was organized for two different groups of participants that had different programs to follow. The event has been considered a masterpiece of planning, logistics and timing as the two groups autonomously stuck to the program without overlapping. This excellent performanceenabled Almar Jesolo Resort & Spa to get two awards: Best Hotel Venue and Best Versatile Venue. It represented the best result achieved in Eventex 2019 edition, the prestigious accolade that is assigned for excellent results, high-quality services or technical merit in producing cutting-edge event experiences. Eventex Awards is among the most ambitious and famous competitions in the MICE world globally: with ten years of history, it is a synonym of success and excellence. In order to better understand the success of Almar Jesolo Resort & Spa, it is necessary to add that more than 1600 case histories in over 800 companies coming from 85 countries competed at Eventex 2019. Almar Jesolo Resort & Spa is an elegant 5-star hotel overlooking the seaside in Lido di Jesolo. The Auditorium is with natural light, can host up to 530 people and can be divided into three rooms – a plenary and two galleries. All the meeting rooms are equipped with advanced technologies. 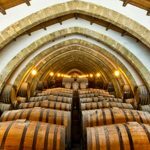 They can host also cars, vehicles and large objects and they have independent access. The hotel is barrier-free. Guests may find also a vast parking.